The Israeli gaming industry is on the move and is a space to watch for both gamers and VCs. To tell the crowd more about this, the Maxsaal hosted the biggest panel of DLD13, consisting of no less than seven dedicated gamers and developers. Yuval Sapir of Yahoo, Doron Nir of Happy Sale Ltd., Nir Miretzky of TheGamers.tv, Uri Marcharnd of Overwolf, Shaul Olmert of PlayChangersMedia and Sam Glassenberg and Yaron Leifenberg - both from Funtactix - were on the stage. Gamers by heart, the seven panelists offered insight into both the mentality of real gamers-turned-developers, and the special knack for entrepreneurship and innovation that has come to characterize Israel in recent years. "I am not allowed to play games for my doctor," said Doron Nir, "But I am gamifying this process. So I get experience points as a reward for not playing." 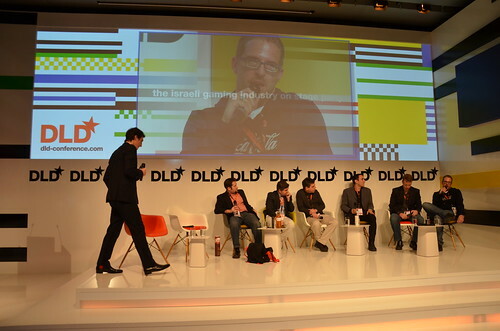 "Israel and especially Tel Aviv is becoming a hotspot for social gaming," the panelists agreed. This because of practical details like free wifi and a large start-up the community, but also because of a special mentality. Israelis like to create and share their experiences,"so you can always get feedback immediately. There's a certain dynamic" said Lefienberg. The stage itself also had a certain dynamic, as the seven panelists had brought with them a bottle of whiskey for a very special drinking game: Every time anyone said 'Zynga', a shot of Scotch was downed. Israel has yet to create its own Zynga, but there are signs that something big is brewing. VCs are getting more and more interested in the industry, and people are getting better at what they do. A core trait of this development is a certain segment of innovators that are dedicated to their cause. "It's not clear how to make money, but the people are gamers, fully dedicated. It's their passion. Are we an empire of quality content production? Not yet, but we are showing good signs," Olmert posited. With over 50% of revenue currently coming from in-game purchases, new platforms springing up overnight and massive gaming ventures like Call of Duty making millions on every release, this paints a rosy picture for the industry as a whole. For Israel, opportunities grow, too. "It's a sign of better times," the panel concluded, "thanks to a community that becomes better as it matures." Just like, well, a good bottle of scotch.